Wine jelly is pretty common stuff. Grapes are, after all, fruit, and so wine can be made into a pleasantly fruity jelly—with a grown-up edge. Beer can also be made into jelly, unusual though that sounds. Guinness suits itself particularly well to it, as it has rich notes of cocoa and molasses that play nicely with the sweetness of a jelly. While beer is slightly acidic, it is not acidic enough for water bath canning on its own. Guinness clocks in at a pH of about 5.5, so the vinegar, in this case, is necessary to bring the acidity up to safe levels, as well as to make the pectin set. It also adds brightness and balance, without interfering with Guinness' flavor. 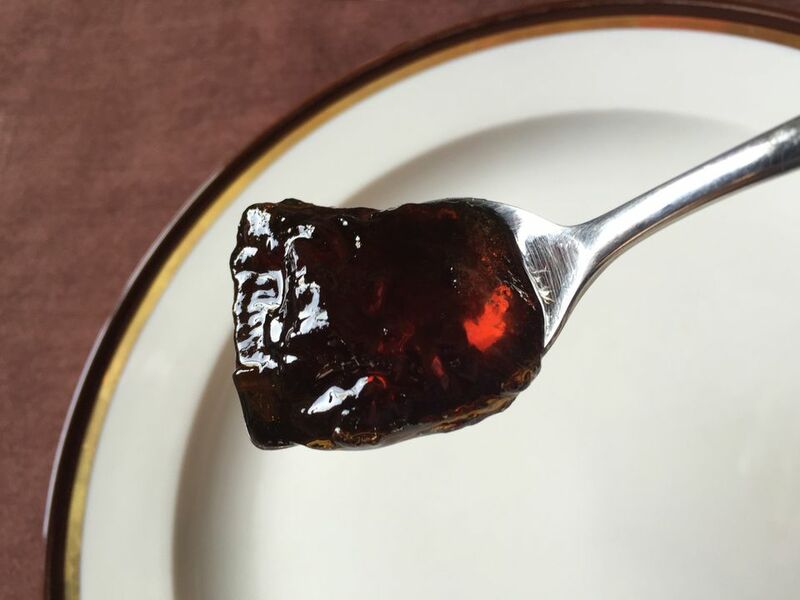 The jelly is a complex condiment, with the rich notes of Guinness stout, including a slightly bitter edge that plays against the sweetness. This is probably not a jelly you're going to spread on toast, and certainly not pair with peanut butter. However, it makes an intriguing complement to stronger cheeses, like Parmigiano-Reggiano, or even assertive blue cheeses. It can also be used as a glaze on roasted meats, like ham, or as a component of a barbecue sauce to bring a depth of flavor. Prepare your water bath canner, and have 6 clean half-pint jars at the ready. Pour the beer into a large stockpot; it will foam considerably. Add the vinegar. Put on high heat. In a small bowl, combine 1/2 cup of the sugar with the packet of pectin, and whisk to combine thoroughly. Add the sugar-pectin mixture to the beer, and whisk to dissolve. Bring the beer to a boil. Add the remaining sugar, and return to the boil. When the mixture returns to a full rolling boil, cook for 1 minute, then remove from heat. Skim away any foam or scum from the surface. Pour the jelly into jars, leaving 1/2" headspace. Run a clean spatula or chopstick around the periphery of the insides of the jars to release any trapped air. Wipe the rims clean with a moistened paper towel. Apply lids and rings, and process in a water bath canner for 10 minutes.